You can resize your table to a minimum size of 500x365 pixels and a maximum as you screen resolution allows. 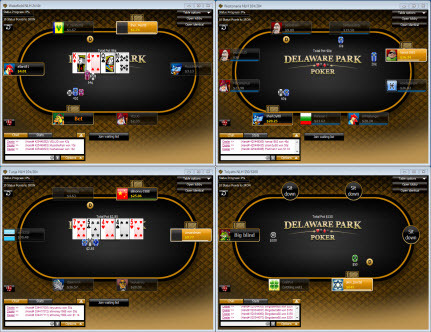 Table tiling enables you to view nine full table screens at once. The tables are automatically adjusted to fit your screen at a size of 500x365 pixels each. 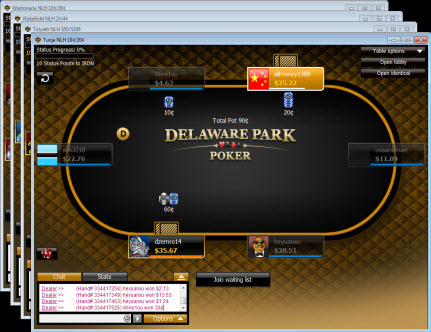 Any additional open tables, tournament lobbies and poker lobby screens will appear in cascade view on your screen. Poker Table Chat can be both entertaining and informative, but at Delaware Park Poker we want you to be able to pick and choose just who you would like to converse with. If you do not wish to communicate with any particular Member, simply right click on that player's seat. An option box will open. Click on "Disable Chat". You will no longer see Chat Messages from that Member. Delaware Park Poker's Player Notes feature allows you to keep your observations of other Members' behavior and playing styles. When seated at a table, just click on the name plate of the Member that you wish to keep notes on, and then click on the "Player Notes" option. A player notes window will appear. Here you can write anything you want about the player and assign him a colored label. You can choose one of the default texts or click on a field and add your own text. Alternatively, you can tag the player with one of the animal icons in the screen. Mark the label you wish to give the player and click on Save. When you return to the table, your label and a notes icon will appear on the players' name plate. Mouse over the label to view the text. You can click on the notes icon to read and edit your notes. 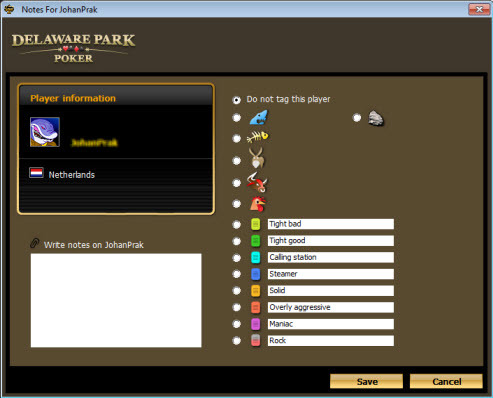 Player notes and labels are saved in the Delaware Park Poker application and will appear on the name plates until they are removed. 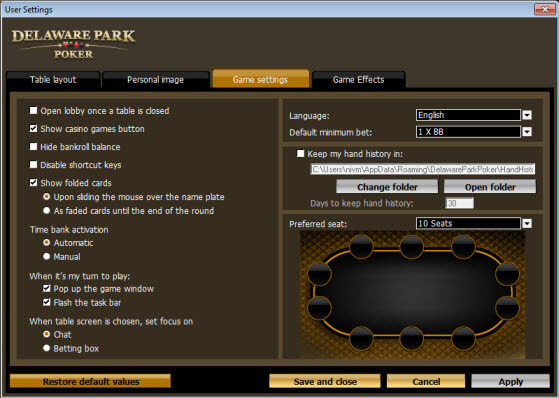 The Settings screen allows you to customize your poker experience at the tables, including graphics, sounds, alerts, and loads of other features. 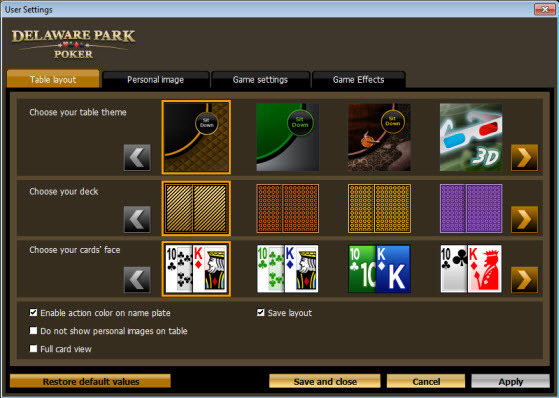 Choose between 3 different table themes, disable animation, see your folded cards all the way to river, and more. You no longer have to switch to the tournament lobby to access information about the tournament that you have selected to play. Click the Info tab on the chat box and see at a glance information about your tournaments, including number of remaining players in each tournament, your position in the tournament and the highest, lowest and average stacks.